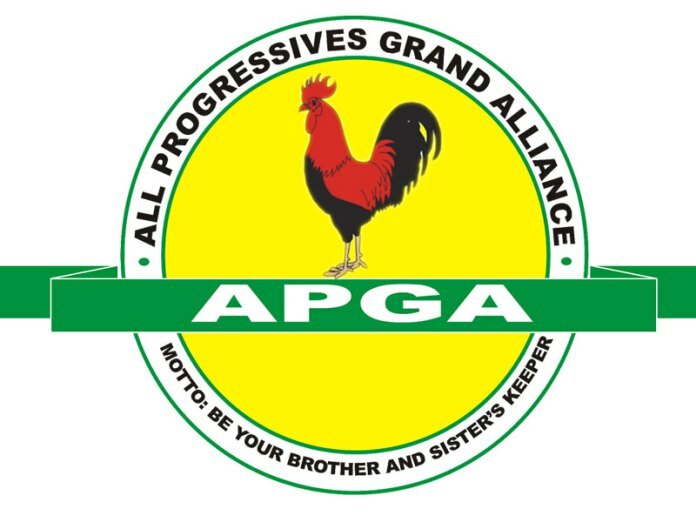 In a dramatic twist of event, the All Progressives Grand Alliance under the chairman ship of Barr Peter Ezeobi has suspended, suspended the Deputy state chairman, Dr Chima Nwosu, the State Organizing Secretary, Hon Steve Anyawom and 4 others for anti party activities, while stating he is the best chairman in the South East. Addressing journalists in a media briefing at the party secretariat, the chairman dismissed allegations leveled against him as fictitious, baseless and done with malice. Speaking further, he informed that those suspended were rather involved in anti party and fraudulent activities against the party constitution. Ezeobi who stated that due to cases of misappropriation of funds in the party, they were mandated not to handle cash, maintaining that he doesn’t handle cash for the party, adding that the allegation of his siphoning party were all lies. He however informed that it was the culture of the State Financial Secretary, Hon. Jude Ekejiuba who he further informed was on suspension before now for charges relating to party funds and anti party activities. The said Hon. Jude he said, who also signed for his suspension was alleged to failed the rules of the party by going to meet aspirants, mandating and threatening them to give him money. In his words” I am very competent, I am the best Chairman in the South East, I am not mincing words”, he boasted. While suspending Nwosu and his cohorts indefinitely, the state exco made up of 21 SWC members, 22 LGA party chairmen and 19 LGA Secretaries in attendance also referred the case of suspended members to the disciplinary committee of the party. The State Exco of the party also passed a vote of implicit confidence on Ezeobi and the entire SWC of the party, and affirmed Senator Ifeanyi Araraume as the guber candidate for the party. Recall that some members of the state working committee, led by the Deputy State Chairman, Hon. Dr. Augustine Nwosu, Tuesday, suspended the State Chairman, Barr. Peter Ezeobi for charges bothering on inability to account for financial transactions of the party, anti party activities, manipulating process of electing candidates of the party through the introduction of harmonization against the rule of the party, amongst other charges.